You never know who will come calling these days. 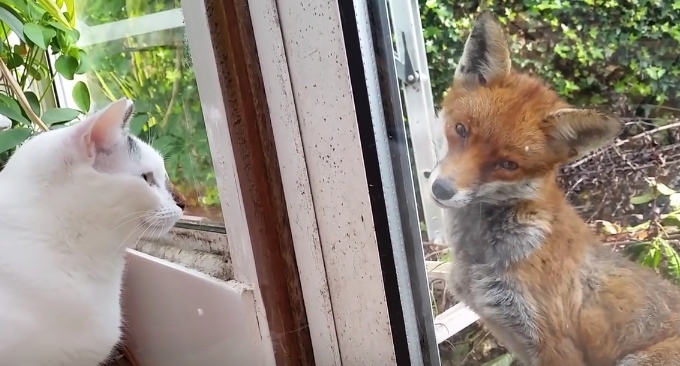 Dan Bull and his two cats, Sammy and Jimmy, were hanging out at their U.K. home when Jimmy noticed a visitor at their back door. Surprise! A suave fox. Both parties seemed a little baffled, but according to Bull, neither of his cats nor the fox acted hostile — just with a "relaxed inquisitiveness." But, alas, all cute encounters must come to an end. "I must go," said the fox. "I have rabbits to catch, other windows to visit." Fox is a shy mammal that looks almost dog-like and it can be seen throughout the country on farmlands, moors, in woodlands and in towns and cities. It is a member of the dog family and lives in a family group which consists of a Dog Fox, a dominant Vixen and often two more Vixens which help to raise the young. Responses to "Cat Notices The Most Unexpected Visitor At His Door"
Ok, I think your last assessment would be correct. Food is the first thing on any wild animals mind, especially if they live in or close to the city. The voice you hear is Danbull a incredibility talented rapper. Fox looks a bit poorly. Perhaps he was asking for help.